Losing a tooth is never something we want to go through. However, advances in dentistry have made it possible to replace missing natural teeth with the next best thing: dental implants. Today, patients have more than a few options when it comes to choosing an implant that will address their specific needs. Here, we discuss mini vs. traditional dental implants, and how to know which option is the right one for you. At Harlem Center for Aesthetic Dentistry in New York, NY, our doctors offer both to meet the unique goals of our patients. Traditional dental implants are the most commonly used implants in dentistry. They are the standard treatment for missing teeth. Designed to replace the roots of missing teeth, they restore full function to your smile. Crafted from surgical-grade titanium, traditional implants are incredibly strong and durable, and often last a lifetime with proper care. In order for a traditional implant to be successful, it must be surrounded by healthy, dense bone. Therefore, patients who have traditional implants placed must have plenty of bone structure available to support them. This requirement is considered the only drawback to traditional dental implants, as some patients simply have lost too much bone to make this treatment a viable option. Also made from titanium, mini dental implants come in various lengths, but what sets them apart is that they are about half the diameter of their traditional counterparts. Because of this feature, patients who were previously not eligible for dental implants can now become candidates, including people who have experienced significant bone loss. Like traditional implants, mini implants provide support for crowns, bridges, and dentures. They are commonly used to stabilize a denture, giving patients with extensive bone atrophy the ability to chew and speak with confidence. The surgical procedure is typically less invasive, as well. For this reason, mini implants are an excellent option for those who cannot undergo extensive bone grafting procedures in preparation for traditional implants. The drawback to mini dental implants is that they place a bit more stress on the jawbone when compared to traditional implants, due to the different weight distribution. Because of this, they typically require longer healing times. Typically, we recommend traditional dental implants when possible. With a greater surface area, they provide optimal long-term stability. However, mini implants are an excellent choice for those who are lacking bone density. Patients who have endured years of an unstable denture can significantly improve their quality of life with mini dental implants. Many patients are interested in mini implants because they are more affordable. 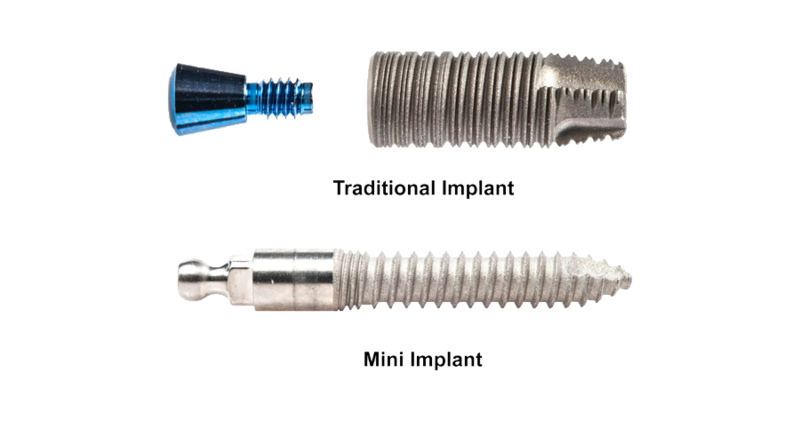 However, it is important to understand that it takes two mini implants to equal the strength of one traditional dental implant. Knowing this, cost may become less of a factor. The only way to know for sure which type of dental implant is optimal for you is to have a consultation with one of our doctors. During your visit, we can listen to your concerns and design a personalized treatment plan that will address your unique dental needs. As always, our team of professionals is available to answer any questions you may have about your treatment. To speak to a team member or to schedule an appointment, contact us online or call our office at (212) 283-4800.